insisted that reports of a recent attack she suffered at the hands of her boyfriend have been grossly misrepresented in the media. She is pointing fingers at one of her relatives, claiming that the individual exaggerated the truth. Reports published extensively by this newspaper and other sections of the media earlier this month revealed that the 38-year-old woman was severely beaten with a hammer by her boyfriend, Joseph Taylor. Reports are that relatives found her in an unconscious state in a relative’s Non Pareil, East Coast Demerara home. It is alleged that in addition to being beaten with a hammer about her head by the perpetrator, he also inflicted wounds with a knife. Garraway was rushed to St Joseph Mercy Hospital where she remained a patient for four days during which time she was disoriented and appeared to have been suffering from memory loss, one relative said. Police subsequently issued a wanted bulletin for Taylor who is said to be a vendor and has had associations with the local and regional sports fraternity. In fact, in 2009 he was given a special award for his contribution to the off-the-field entertainment, compliments of the Guyana Cricket Board when it held its annual Awards Ceremony. Yesterday, Garraway said that her intention was to testify to the fact that the man is not guilty of doing what was portrayed in the media. “I want to clear him out of this problem…because, to be honest, is 12 years I living with he and he never put a hand on me.” While admitting that she was attacked by the man on the day in question, Garraway said that it certainly was not with a hammer. She said that she suffered no broken fingers as was reported by one of her relatives. Recounting her version of the incident, Garraway said that she had upbraided Joseph about drinking too much which may have triggered his reaction to push her, causing her to slam into a refrigerator and fall. She claimed, too, that unlike the details of the article she was never unconscious at any point. She recalled that the man had armed himself with a knife after she threatened to throw some hot rice on him because of his evident drunken state. She was insistent that no one forced her to clear her boyfriend’s name. Garraway said that it was only a few days ago that she became aware of what was published in the media. 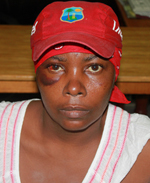 Her appearance at Kaieteur News came after the police issued a wanted bulletin. According to the bulletin the man is wanted for questioning in relation to the attempted murder of Garraway on April 4, last. It also notes that anyone with information that may lead to the arrest of Taylor should contact the police on telephone numbers: 229-2557, 229-2702, 226-1326, 225-8196, 225-6411, 911 or the nearest police station. For his part, Taylor had said that he would turn himself in to the police when the woman was discharged from hospital. However, he is yet to do so.